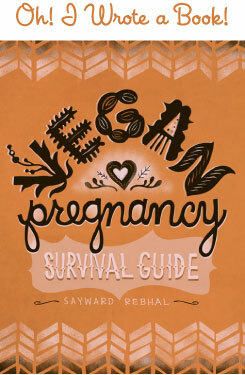 The RAW 101 series is a practical approach for incorporating more living foods into your life. We need to be clever if we’re to succeed when faced with family or friends who are less adventurous eaters. RAW 101 presents delicious and simple companion meals – raw and cooked counterparts – so everybody wins! In this installment we explore one of my very favorite foods: sushi! At times I get a bit fancy-pants, but that’s only because it’s fun for me. I also cover the absolute basics and the take-away message (I hope) is that, more than anything else, sushi lends itself to flexibility, creativity, and best of all, playfulness. You don’t need the exotic ingredients (though they can be fun). All you need is your own enthusiasm! Though sushi is truly a platform for epicurean exploration, there’s a few key things that’ll make for a more magical experience. These items should be available at most big supermarkets or smaller health food stores. Specifically Asian or general ‘ethnic’ markets are also great for finding deals. Nori - Sheets of seaweed that wrap the rolls. Nori is insanely good for you! It’s also almost always toasted, meaning it’s not actually raw. Most raw dabblers I know overlook this detail, and so do I. 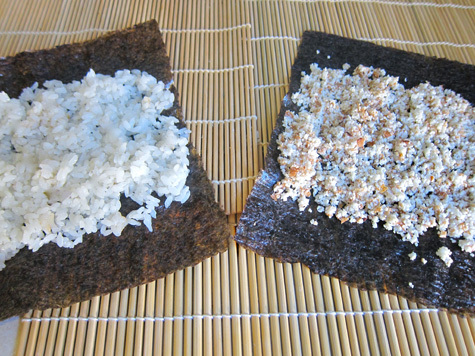 But if you want to go for purity you can find raw nori online. Sushi Rice – For your cooked companion. This is more than just white rice! 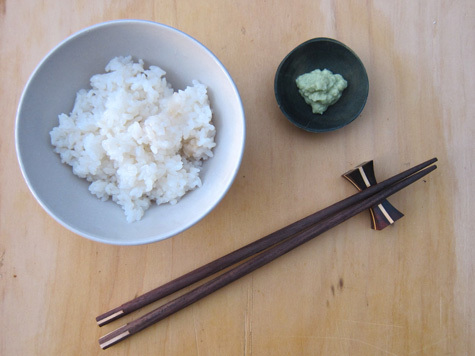 Sushi rice is a special short grain, and mixed with a bit of rice wine vinegar and sugar. Super easy to make at home. Assorted Additions – All your favorites, whatever you can imagine! Raw veggies of all stripes, raw fruits, grilled or sautéed tofu or tempeh – these are just the basics. Let your mind wander, ’cause there are no rules! Accompaniments – Shoyu/tamari/soy sauce, wasabi, and pickled ginger are traditional. Nama shoyu is raw. So you’ve got your nori and your rice, your fillings and toppings and dressings and dips. Now what?? Let’s start with a basic, classic roll. Maki (rolls) In Progress: cooked, left, and raw, right. Replacing rice is easier than you might imagine! Here, I’ve used almond pulp leftover from making milk. Mixing in a splash of rice wine vinegar and a drizzle of agave will add authenticity of flavor. If you don’t have pulp you can use whole nuts/seeds to whip up a quick paté. I’ve seen people using soaked and blended oats, or finely diced cauliflower. Let yourself be creative! Once you’ve spread your rice/rice-sub in a thin layer (tip: keep a bowl of warm water handy and dip your fingers frequently to prevent a sticky mess), you’re ready to lay your fillings. For these I used some old standbys – cucumber, carrot, avocado, and bell pepper. But you can use anything imaginable! Some of my favorites are pickled vegetables, herbs like basil or mint, and um, leftovers. 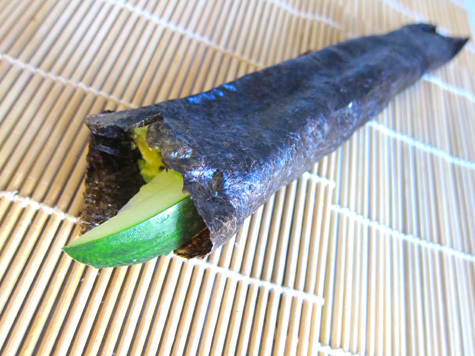 Yup, ANY leftover wrapped up in nori is my idea of a good time. But I may or may not be a big ol’ seaweed weirdo (seaweirdo?). After arranging your fillings, you’re ready to roll (oh, HA!). A makisu (bamboo matt) may help but it’s by no means necessary. The procedure is actually very similar to rolling a burrito – with the same ‘tuck and tighten’ technique – though you’ll leave the ends open. Wetting the edge of the free flap will allow it to stick to itself and seal. Use a sharp knife to slice it up and rinse the blade between each cut (to prevent pulling). And futomaki is born! 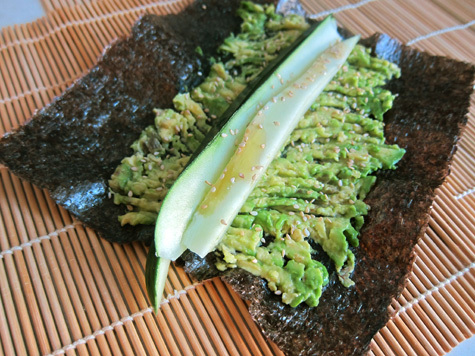 One of my absolute favorite raw riffs is rice-less temaki (a hand roll). Super quick and super easy, it’s also seriously delicious. I use avocado as the base and most often go very light on the veggies. A drizzle of sesame oil compliments the avocado and really takes it over the top! 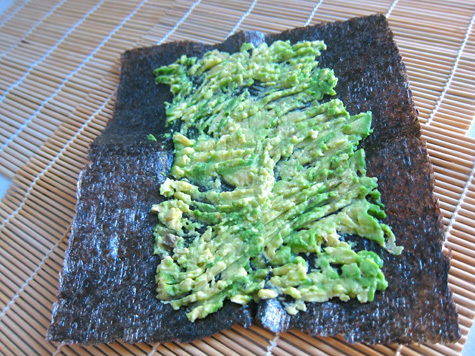 Simply mash half an avo over your nori. Add whatever fillings you prefer – here I’ve kept it clean with cucumber and sesame seeds. And then roll it carefully, aiming for a cone shape that’s nearly closed at one end. This takes practice and though my brother was a professional sushi chef, clearly I . . . am not, haha. 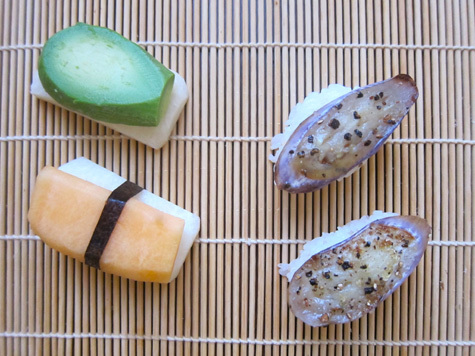 Avocado and cantaloupe nigiri, left, and grilled Japanese eggplant nigiri, right. 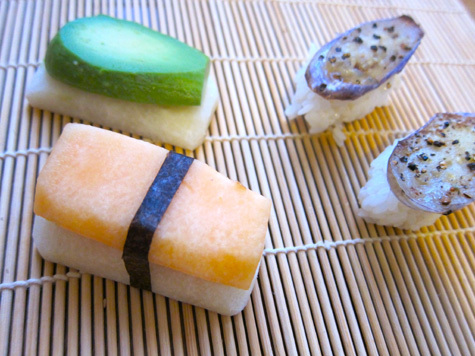 For the raw nigiri pictured above, I replaced the sushi rice with raw jicama – which worked splendidly! I think a cauliflower floret would be beautiful as well. You could even use banana, but then you’d be straying away from an accurate flavor profile. But of course, you can be creative! Raw or cooked, vegan sushi is one of the most colorful, most creative ways to try new foods and new preparations. Do you make your own sushi? What’s your favorite combination? This is SOOOOO coooool! I LOVE sushi! Who doesn’t?! I only recently discovered that sushi can be vegetarian/vegan :D My friends were making sushi (with fish) the other day and that really made my mouth water. 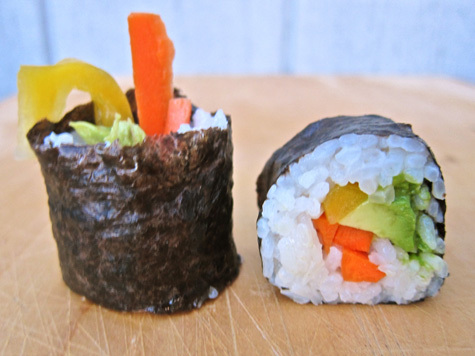 So, vegan sushi is on my to-do list. Thanks for the great motivation! That temake must be soo delicious! Awesome post – we love sushi! Favorite fillings always include avocado and really thinly sliced crunchy veggies like cucumber and carrot, and pan-seared sesame tofu. My daughter doesn’t like the taste of nori, so we either make her a “sushi bowl” or a burrito – but I manage to crumble a little bit of nori into her rice – slowly acclimatizing her to the seaweed’s flavor. Also, Nina eats so much of the sushi rice that we have to make double, just to have enough for our rolls. Another thing that you can use instead of nori is steamed whole collard leaves. Just cut out the hard rib in the middle, steam for a few minutes and then blanch them in an ice bath.. They are a perfect substitute and super cheap! @Crystal: Great idea! Unfortunately, we use raw collard leaves as a different style of wrap and Nina doesn’t suffer shortcuts in the kitchen – I can already tell you what she would say if I tried using them for sushi – “Oh brother, Mother!” She’s very particular about her food presentation! I used to make vegan sushi ALL THE TIME but haven’t in the last year or so. I’m not a big fan o’ Nori, so I make mine with the rice on the outside so I don’t notice the taste. I make sushi quite a lot. I can get creative, but I really love avocado and cucumber or avocado and crispy tofu. If you’ve got a good thing, stick with it! I always have sushi with an epic amount of wasabi. My partener identifies this as ‘absolutely f**king crazy’. These look delicious. My husband makes the best homemade sushi. I am going to ask him to try making it vegan next time! I’m def. trying this out! Cool. I wouldn’t have thought it was so easy to make sushi! 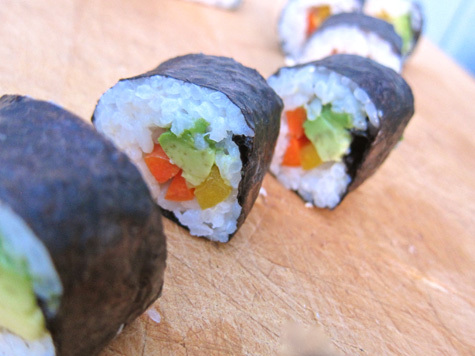 Love sushi and YEP–have indeed made my own (both veg and nonveg). But, my ALL-TIME FAVORITE (which I miss soooo much) is the vegetarian lover’s sushi from Wild Rice restaurant in my home town in Connecticut. Man–do I miss this stuff!!! It is veggie sushi (made with asparagus, cucumber, avocado, and brown rice and then…the whole thing is wrapped up in nori as well as sauteed shitake mushrooms on the outside!! It also comes the absolute best, most AWESOME pickled daikon, cucumber, carrot, and jicama mixture as a pre-meal nosh (spiked with some thai peppers and some whole star anise..even though I despise anise flavor the hint of exotic flavor really does something). Are you salivating yet?? I am! Using finely chopped steamed cauliflower instead of the nutrition free white sushi rice is brilliant. I have tried so many things over the years that have not quite made it. I bet cauliflower will be splendid. Thanks for another great post…and good pictures too! @ Crystal – Are you saying you wrap a banana and nut butter up in nori?? 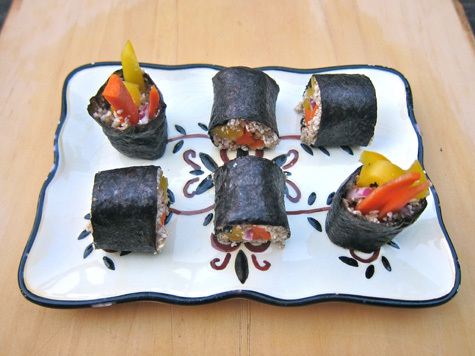 @ windycityvegan – I’m so looking forward to making sushi with Waits! @ Rebecca – Yeah, it’s an either/or sub on the rice. I’ve tried using soaked and sprouted rice, but the texture is all wrong, even if I could get past the taste. =( Raw rice is not for me! Anyways, I want to contribute a tip to all you sushi lovers (or RAW purists) in pursuit of a nori-less maki. This is what we used to do whenever someone wanted to ‘test’ the chef’s skills by asking for a maki, after proclaiming they hated the taste of nori. It’s a technique I learned from my sempai, and it takes a bit to perfect, but it makes a good –albeit different– kind of maki. First you start by making a cucumber sheet. Take a look at the first part of the video. You will need a very sharp knife, patience and a fresh cucumber. Don’t make the sheet so thin you can see trough it, as you need it to provide stability to the maki, but don’t make it so thick it will break when rolling it. As I said, it takes a while to get it right, but stick with me, as once you master the technique, the results look (and taste) awesome. Now, cut the sheet in pieces about the same length of a nori sheet, and line 2 cucumber sheet pieces side by side, overlapping them a little bit. Put about a handful of rice, a touch of wasabi and the fillings of your choice. Try to use contrasting colors and bold flavors, but don’t go overboard, 2 or 3 fillings will do the trick. Thin sticks of carrot, some red peppers or some tamagoyaki (japanese style omelette, easy to make, not exactly vegan friendly though), tuna (a personal fav, sorry vegans) or a leaf of those purple lettuces. 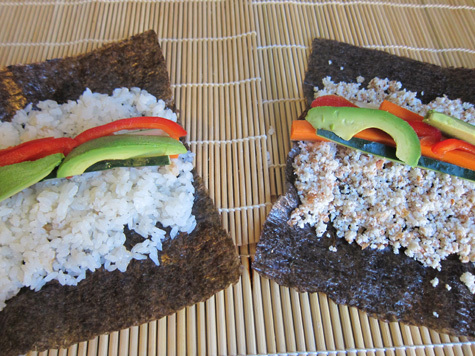 Roll it and decorate with kuro goma (black sesame seeds) or some furikake (one without nori of course). Plate with some gari (pickled ginger, the pink type would look beautiful), and maybe a “pinch” of micro-greens topped with red onion on the side. @ erosan thats sounds xtremely tasty, I mean the cucumber in place of nori. lol id still have to addnori, probably chopped up in the rice. Definitely a good trick to learn. @ erosan – Beautiful and a great idea for raw! I gotta try that (though I do love my nori). Thanks for the tips!